Mobile Work Platform with battery power. Joystick Controls. Mobile Work Platform scaffolding provides many advantages over a engine driven scissor lift. It is environmentally friendly as it produces zero emissions. This feature also allows it to be used indoors. The electric motor is extremely quiet and allows for indoor use any time of day. The electric drive train is also suitable for outdoor use. 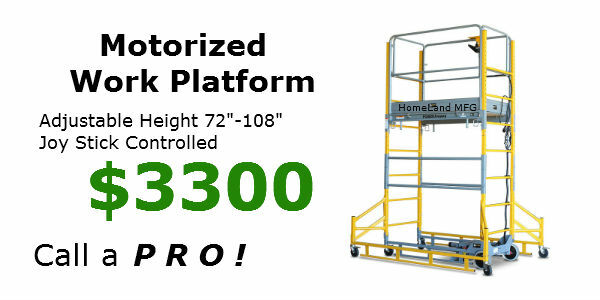 The Mobile Work Platform is joystick controlled for easy steering. Scaffolding is manually height adjustable. Powerful Electric Motors - The Power Snappy is driven by two 24v hub motors, one on each wheel. Each motor is rated at 6,000 hrs of use. Integrated Brake System - The brake system is an auto-locking. This means that when the throttle is off, the Snappy automatically has the brakes applied. Easy Charging - The on board charger can be easily be charged via the built in electric inlet. Security - The integrated lock-out switch ensures proper use by qualified individuals and also adds to the security of the unit at the job site. AGM Batteries - Two 12 volt sealed AGM 35 Amp-Hour batteries power the unit. AGM batteries feature the latest in battery technology and provide exceptional life. Maximum Safety - Complete guard rails are provided and open at both ends for easy boarding access. Quick adjustability - G-pin and snap pin technology escures the arm braces on the power snappy. Adjustable heights from: 24" - 60"
Adjustable Heights from: 72" - 108"